Amid the fun that is the World Series of Poker, there has been an air of heaviness over recent days after it was learned that one of the game's favorite players, Chad Brown, has seen his fight with cancer take a turn for the worse. Players at the WSOP took a moment last week to think about Brown, a friend to many in the poker world and a great ambassador of the game. The poker community has been following Brown and his battle with cancer since 2011, when he was diagnosed with liposarcoma, a very rare form of cancer. Since the diagnosis, he has had five surgeries, multiple radiation treatments and various chemotherapies. While his body might not be cooperating, his mind and spirit are still strong. In fact, in that same blog, he spoke about heading to the poker tables between treatments when he was healthy enough to do so. In January of this year he had a runner-up finish in a WPT Borgata Winter Poker Open side event and another deep run in the Main Event, proving his competitive nature is still strong. It is that nature that has helped him manage and fight the cancer with aggressive actions while maintaining a sense of dignity and grace. A cancer diagnosis is always shocking, but Brown’s seemed to be more difficult to hear throughout the poker world. In a game that is relatively sedentary and for a long time held in smoke-filled rooms with cocktail servers on standby, Brown was known for his active, healthy lifestyle away from the poker table. He was the poster boy for a balanced life before it became the latest fad. Friends and fans alike are reaching out to Brown through Facebook and Twitter to wish him well. According to good friend Victor Ramdin, the outpouring of support means a lot. Ramdin, who flies home to New York every weekend to be with his family, recently spent some time with Brown. When we asked Ramdin about his friend, you could see the emotion sweep over him. "What can I say about Chad," Ramdin told PokerNews. "He is my friend. He's struggling to fight this thing. He went to Mexico to try some alternative medicine but it didn’t work. Now they have moved him into hospice and they are trying holistic therapies to keep him comfortable and give him more time. He looks different, the cancer has eaten his body but he is still the same Chad. You can see the change in his appearance but he is still so sharp and aware and hopeful." "People come to visit him and he ends up comforting them and helping them with all their troubles," Ramdin added. "He is the most positive, hopeful and generous person. He said to me, 'come see me next week, Victor.' And of course I will. I will see him next week and the week after and the week after that. Because I have hope." Had a nice visit with a real gentleman and someone I'm glad to call a friend I'm speaking about Chad Brown. I saw him post something on Facebook and realized I haven't made time to go visit him and he's in my city. I sent him a text and with a quick response, I was showered and on my way. I didn't know what to expect but I was glad to find him in good spirits and completely aware of everything going on. If he wasn't in a hospital you would never know he was in the situation he's in... We take our lives and daily situations for granted and after my visit today it puts it all in perspective. Chad I'm glad we were able to spend a few hrs together today, thank you for allowing me to visit with you. Brown has been semi-active on Twitter this month. He is receiving an outpouring of support through the social platform and here is just a sampling. @Downtownchad My thoughts and prayers are with you at this tough time. I am honored to know you. You're a role model for the poker world. Thinking of @Downtownchad today, who's in hospice according to @TexDolly. Such a great guy, warm personality and tough player. @Downtownchad was my first friend in poker when I was 17/18 we played lots of poker. Wish u the best. Miss u and love u brother. @Downtownchad was really hoping for you to win this one.. With the way you've handled it all, I guess you still did. 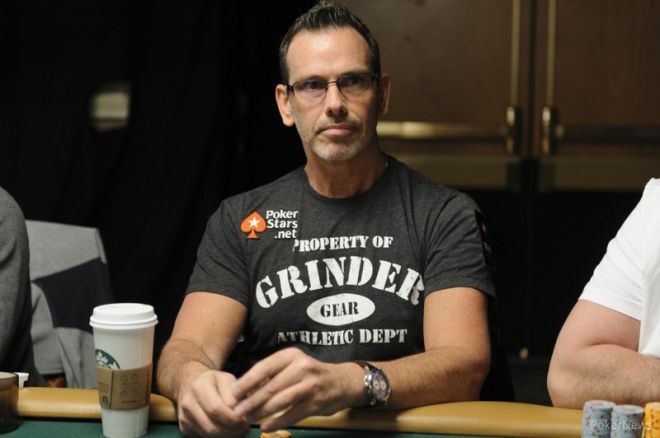 "I think they should give away an honorary bracelet once a year to someone in the poker community who hasn't won a bracelet but because of their contributions to the game deserves some recognition," said the Hollywood actor. "Like they do at the Academy Awards with an honorary Oscar." Woods went on to specifically mention Brown as a possible recipient. "I think I'll talk to Jack," Woods said, referring to WSOP tournament director Jack Effel. PokerNews confirmed with the WSOP similar requests have been made by several players. Then on Saturday, June 28th the WSOP awarded Chad Brown with an honorary bracelet in a ceremony that captured the attention of everyone in the Rio. With 38 WSOP career cashes and over $1.2 million in career WSOP earnings, Brown is certainly a worthy recipient. Jack Effel, Director of the World Series of Poker, said during the ceremony, "with a third and two second-place finishes on the resume, we know it was just going to be a matter of time before we were handing you this."